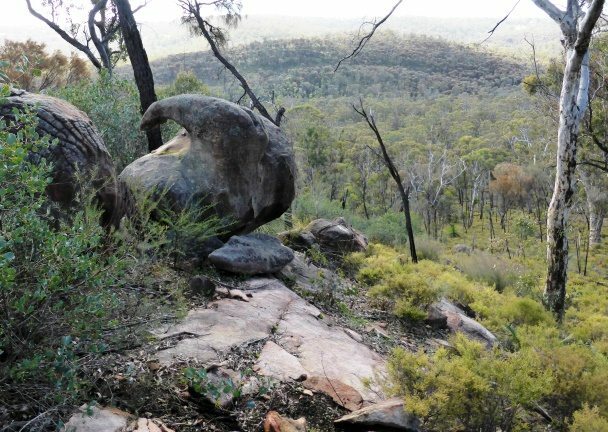 This popular WalkGPS route 20km east of Mundaring offers a surprising variety of terrain and scenery on and around the horseshoe-shaped, undulating ridge of Mount Yetar, and across the adjacent Helena River valley. 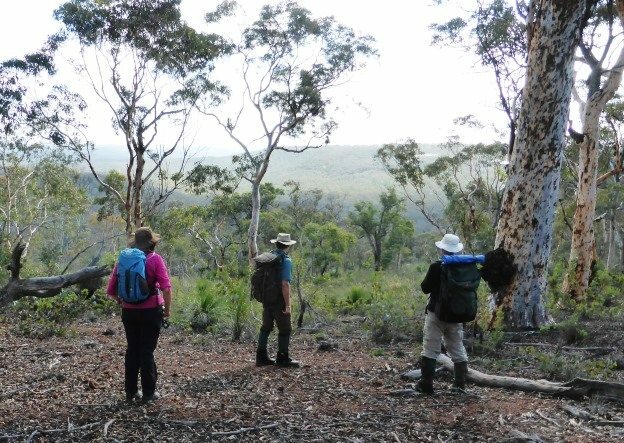 Highlights include the beautiful, tranquil open wandoo woodlands, unusual small steep-sided laterite-capped ‘buttes’, the Helena River crossings and some lovely views. 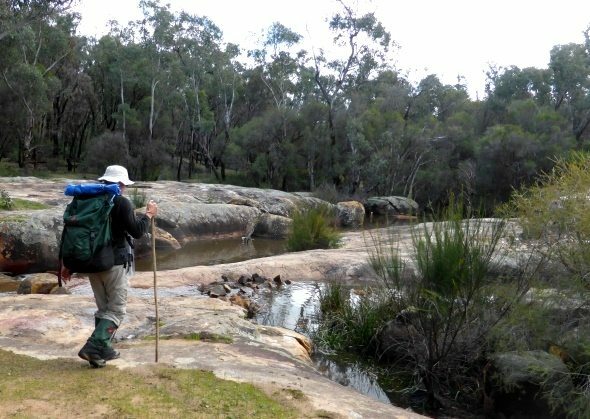 This WalkGPS route has quickly become popular among regular bushwalkers. It’s one of the shorter walks and is 50% on old vehicle tracks, but offers a surprising variety of terrain and scenery. 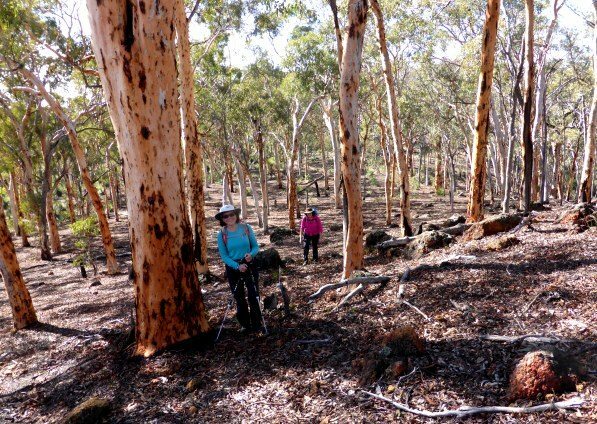 The route straddles the Helena River valley, about 23km upstream from Mundaring Weir and is almost entirely through beautiful open wandoo woodlands with occasional patches of rocky heathland. 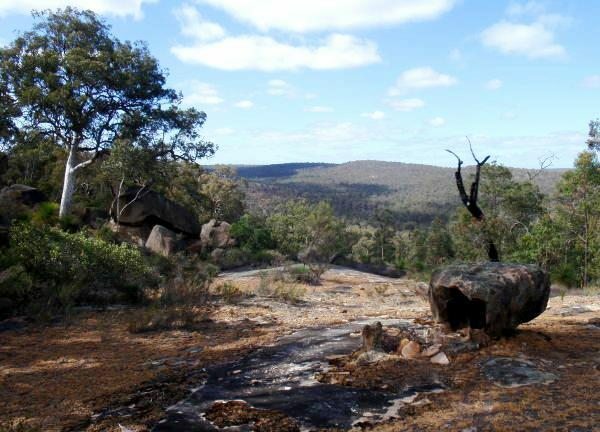 Highlights include some excellent views across the surrounding country (especially across the main valley, and eastward across Mount Billy area and beyond; small laterite-capped ‘buttes’ (isolated, steep-sided erosional remnants); plus large granite boulders in many shapes and sizes (some with small caverns, decorated in one case by recent ‘aboriginal’ artwork! ); plus two pleasant crossing points at fords along Helena River. (The River, when flowing, is normally no more than a very small stream, usually easily and safely crossed without getting boots wet). The route includes (for 2km) most of the horseshoe-shaped, undulating ridge of Mount Yetar. 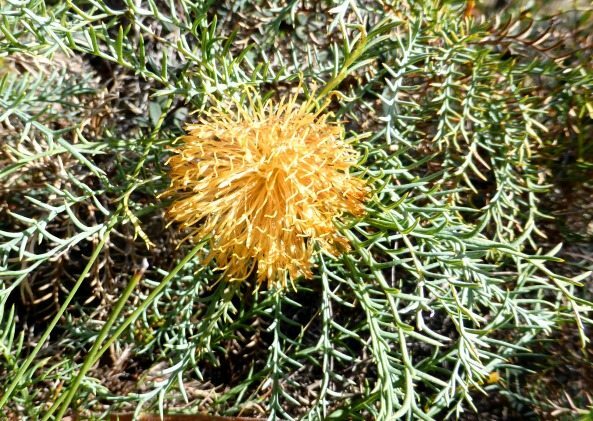 The actual summit itself is heath-covered and unremarkable, and so is bypassed via the wandoo woodlands on a southern spur ridge. 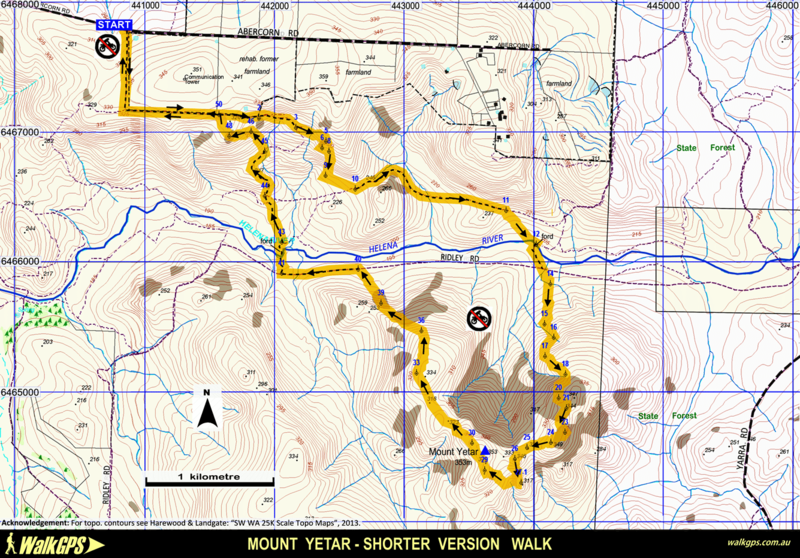 The overlap between this route and the longer alternative Mount Yetar Walk (16km) is less than 1.8km (along the main Mount Yetar ridge) and the route along the ridge is slightly varied, so most walkers will find that both walks are worthwhile and offer a different overall experience. Although this walk is 2.5km shorter than the alternative longer walk route and is 50% on old vehicle tracks, there is a little more uphill climbing (elevation gain) and some steepish, pebbly slopes, so walkers still need to be reasonably fit. There may be short sections of low scratchy heath. Head south from the start point (‘START’) following a vehicle track along the fenceline perimeter of former farmland (being revegetated) on the left and forest on the right. 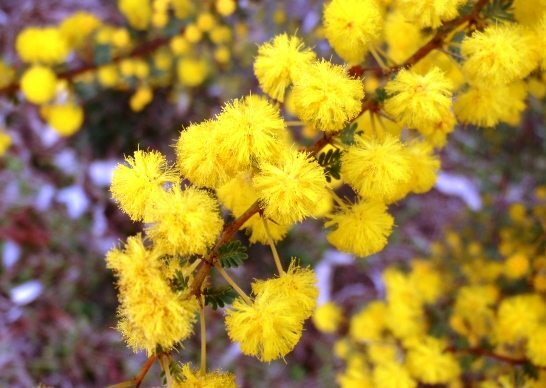 (For information on the revegetation project see ‘Other info.’ on this page). 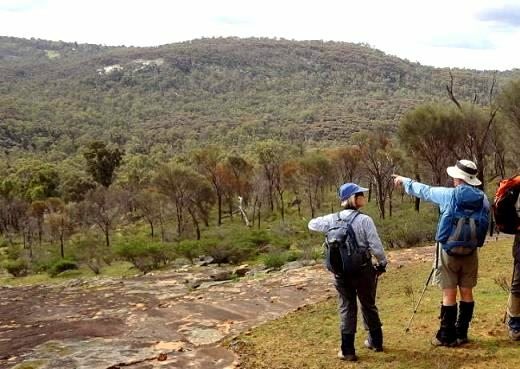 At waypoint ‘1’ turn left to continue along the fenceline track to ‘2’ where a large sloping granite slab provides an excellent view across the Helena River valley to the horseshoe-shaped ridge of Mt Yetar. The old vehicle track then leaves the fenceline to cross a gully through wandoo woodland and begins to curve SE-ward. At ‘3’ leave the main track to follow a secondary track on the left to a granite outcrop and boulders at ‘4’, where there is again a good view across the valley. Continue SE, but now off-track, to cross a small gully (keeping an eye out for the small cavern in a boulder near ‘4’ which contains some clearly modern efforts at aboriginal rock art). Pick a route through the cluster of large boulders and veer upslope to soon reach a domed outcrop (at ‘5’). Detour around the eastern side of the boulder cluster via ‘6’ to locate (at ‘7’) a smaller boulder on the south side with a small cairn on top, and a view SW-ward down the valley. Return to ‘6’ and head ESE to ‘8’ before descending quite steeply southward to ‘9’. through open woodland to reach another domed outcrop at ‘9’. Then head SE-ward along slope to meet a dirt road at ’10’. Follow the road for 1.3km. It initially veers around a small hill, then crosses a gully and another low spur ridge before descending toward another gully. At ’11’ leave the road to head SE-ward off-track through very open woodland to reach another dirt road at a crossing of the Helena River at ’12’. (Sadly, in recent years the northern river-bank has become extremely rutted and eroded by 4×4 vehicles and trail bikes aggressively using the crossing.) 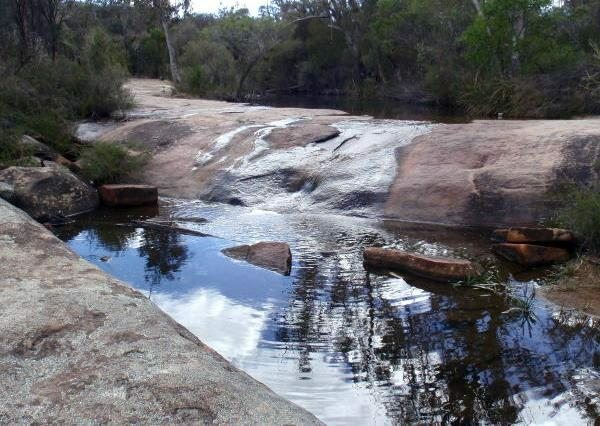 The river crosses a large granite slab here and this makes a good spot for a rest. After crossing the river (usually an easy step-across) follow the dirt road SE-ward to the T-junction with Ridley Road at ’13’. Then head upslope, off-track via ’14’ through mainly open woodland with patches of heath. At ’15’, after crossing a reddish, laterite outcrop flanking a gully, head SE-ward up the gully for about 100m to cross it at about ’16’. 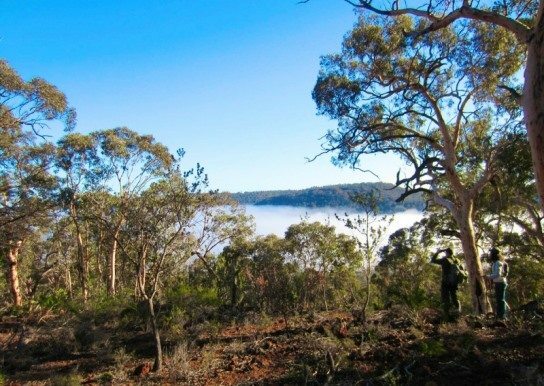 Then head across a steepish, pebbly laterite escarpment through beautiful open wandoo woodlands. On reaching ’17’ again veer SE-ward upslope to cross the rocky eroded edge of the laterite which caps the ridge. At ‘18’ veer S-ward around the head of a westward-plunging gully to reach a granite slab surrounded by sheoaks at ‘19’. Continue approx. 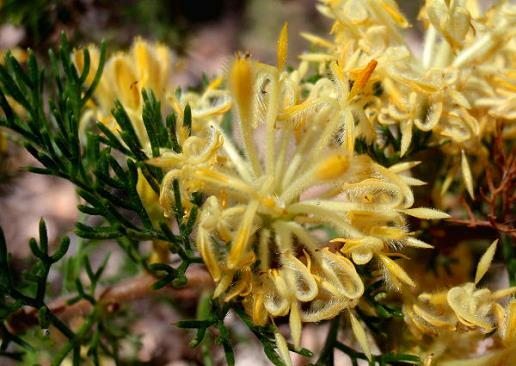 southward, bypassing patches of tall heath, to reach a flat granite slab at ’20’ from where there are good views across the central gully of the Mount Yetar ‘horseshoe’ to the wandoo woodlands on the western side of the horseshoe ridge only about 1km away. Head eastward into a patch of heathland on the crest of the Mt Yetar horseshoe ridge. 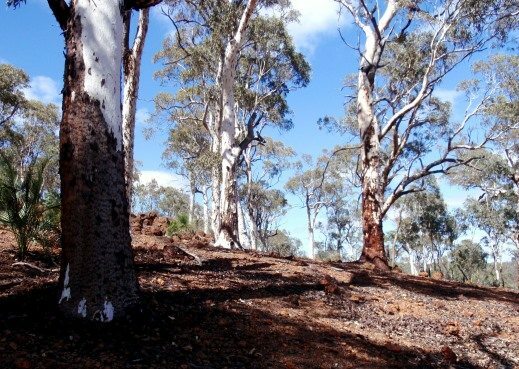 At ’21’ turn right (SSW-ward) and pass through wandoo woodland on the secondary, eastern summit of Mt Yetar at ‘22’. (This has has similar elevation to the recognised summit which lies ~600m WSW with elevation 353m). Then veer SE, to head downslope to a granite slab at ’23’ on the eastern flank from where there is an excellent sweeping view eastward across Mount Billy area and beyond. Turn right to head SW gently upslope through low heath to regain the ridge and cross a small outcrop at ‘23-1’. 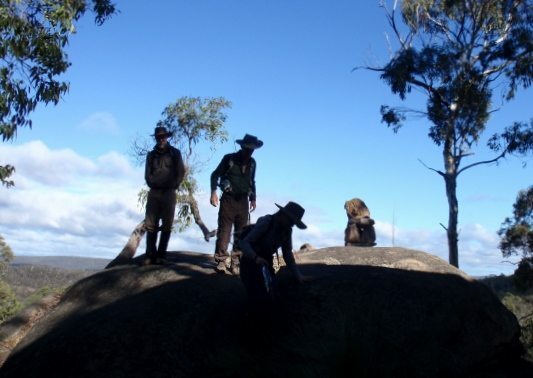 Follow the rocky ridge WSW-ward via ‘24’ down to a saddle area (at ‘25’) in very open wandoo woodland and then climb steeply up a pebbly slope to reach (at ‘26’) a very small remnant cap of laterite. 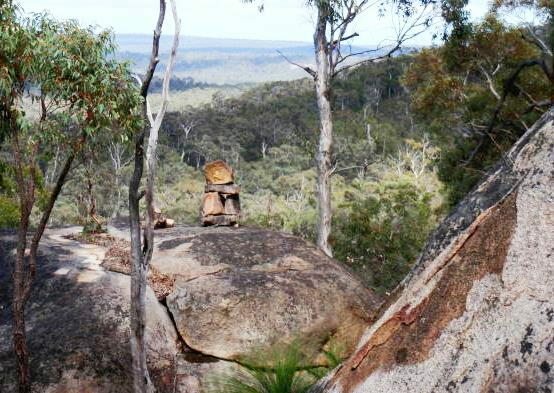 This small knob or butte offers only a limited northward view down the central gully, but its relatively high location and woodland surroundings make this a beautiful and tranquil rest and/or lunch spot at about the halfway point on the walk. Then head southward down the steep slope to reach at ’27’ a narrow saddle below another, smaller laterite-capped butte at ’27-1′. Most walkers will enjoy the short steepish climb to the top of this second butte to view the quite rugged terrain along the SE-flank of the main ridge. Return to the saddle at ‘27’ then veer left (westward) to cross the head of the adjacent gully toward ‘28’. Continue up a partly heath-covered slope to reach (at ’29’) a flat hill top with pleasant wandoo woodlands and an understorey of zamia palms. This is one of the higher areas along the ‘horseshoe’ and is another erosional remnant of a once more extensive laterite surface. The actual Mount Yetar summit area lies just 150m to the north. The summit area is mainly heath-covered and is bypassed by staying slightly downslope on more open ground to the SW while heading for ’30’ about 400m to the NW along the ridge. Look for the easy ways through patches of scratchy heath along the ridge. 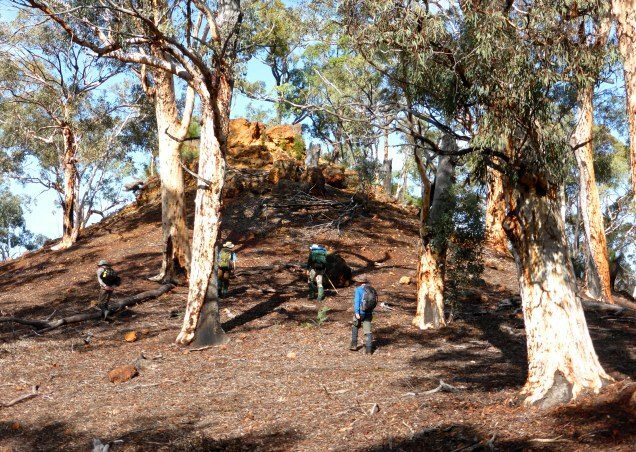 Continue NW via ‘31’ and ‘32’ through a thicket of sheoak and climb up to and across another laterite-capped plateau area to reach ’33’ near the NW flank of the horseshoe ridge. Follow the NW edge of the hill-top to ’34’ from where there is a nice view westward down the Helena River valley toward Mount Gorrie. Head downslope, northward to ’35’ and then ‘36’, gaining good views again across the main Helena River valley. Veer WNW through heath and a sheoak thicket to reach the top of a large, sloping granite slab at ’37’. Then descend NW across the slab and then across rocky ground (passing an interestingly eroded boulder at about ‘38’) to reach a open grassy slope (at ’39’). Continue downslope NW through sheoaks and shrubland to meet Ridley Rd again (at ’40’). Head west along Ridley Rd for 600m to ’41’. Then follow the deeply rutted 4×4 track on the right down to a second crossing of the Helena River at ’42’. 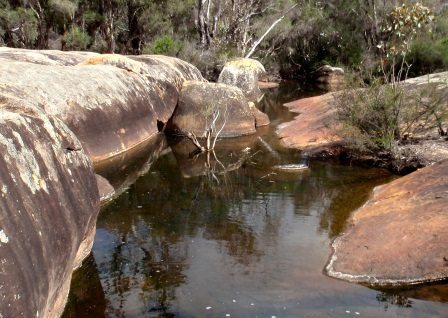 Here the water course drops across a granite ledge and into a long rock pool creating a small waterfall and a peaceful setting (upset only by the debris of past, uncaring visitors on wheels). Again the ‘River’ is usually easily stepped across. Follow the old vehicle track increasingly steeply uphill (via ’43’ and ’44’). Ignore two side roads that join from the right. At ’45’ turn left (NW) to leave the road and pass an interesting cluster of boulders, to then head approx. NW off-track up the steep hillside. Pick an easy route through scratchy heath to ’46’, then veer sharp left (WSW) along slope to emerge from the heath at the edge of a sloping outcrop at ‘47’. Continue across this prominent outcrop to ‘48’ from where there is a wide panoramic view across and along the Helena River valley. From ’48’ head NW up the outcrop passing (at ’49’) a curiously-eroded, throne-like granite boulder, well positioned for gazing out across the valley. Continue NW through open woodland to rejoin the fenceline track at ‘50’ and retrace your outward bound steps for 1.5km along the track (via ’51’) to return to the start point. Turn right into Flynn Rd off Great Eastern Highway and follow for 5 km to a T-junction. Turn right to follow this for a further 1.8 km to turn left into Abercorn Road. Follow Abercorn Road for 2.4 km to the walk start point. Park on the roadside close to the start point which is on the right hand (south) side of the road, from where a rutted dirt track follows a fenceline at the start of revegetated farmland. Park on the roadside taking care not to obstruct the narrow road. Ridley Road (dirt road) runs W-E, close to the Helena River, through the centre of the walk area: head eastward on the road to meet Yarra Road within 3-5km, or head westward for 2-4km to reach Yetar Road (dirt road), then 3km NW on Yetar Rd to reach the end of Flynn Road (and start of Abercorn Road). Alternatively from Helena River, head northward from waypoint ’42’ via the dirt track to then follow the boundary track around the securely fenced old farmland to the start point on Abercorn Road (total 3.3km) as per the later part of walk route. “South West WA 25K Scale Topo Maps”, Greg Harewood & Landgate, 2015. – Digital raster; ECW format on 16GB USB. See tiles #323-2134-II-SE and #324-2133-II-SW for relevant map coverage. Did this last week , the wildflowers were beautiful especially at waypoint 4 and climbing up to Mt Yetar. It was sad though to see how the the last river crossing,( although beautiful rocks and rock pool), had been trashed by overnight campers, broken bottles, etc. As always Dave, thanks for expanding my walk areas with your wonderful site. My second outing on this route provided by Dave. The first time was a rainy July (Makuru) day a couple of years ago. As good as that first walk was, this most recent visit was delightful. Kambarang proved to be the better season with an abundance of wildflowers, a little rain, and magnificent views across the valley. We enjoyed close encounters with bobtails, an echidna, and even a juvenile Brown Goshawk that landed right in front of me! Plenty of evidence of roos in the area, and one very large set of emu prints. Thankfully, not too many trail bikes in the area, being further east of their Flynn Rd haunts. Unfortunately, the first crossing point looks like it had been used as a campground with broken glass, one or two foul messages painted on the rocks. I can only hope nature will win out on the latter, as the river washes the paint away. Don’t let that put you off – get out there and enjoy it yourselves! 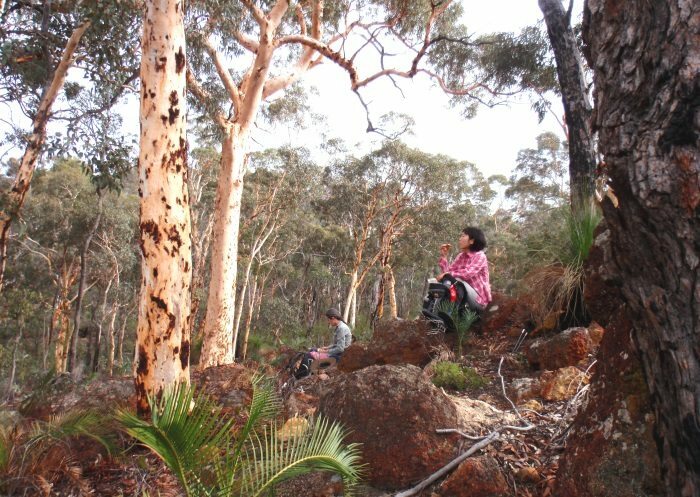 Walker enjoying the ambience of the wandoo woodland on Mount Yetar. View toward Moun Yetar area from north of Helena River. 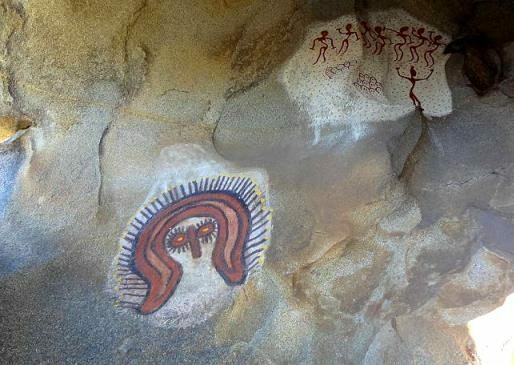 Pseudo-ancestral aboriginal art in rock cavern. Cairn on granite boulder, north of Helena River. 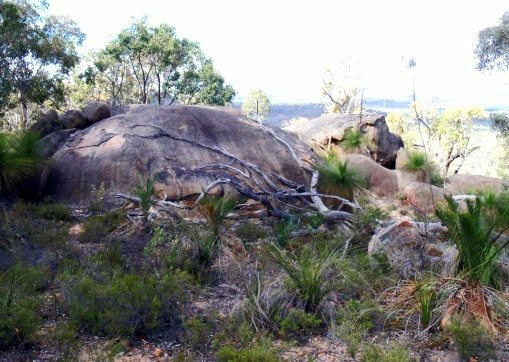 Domed granite outcrop, north of Helena River. 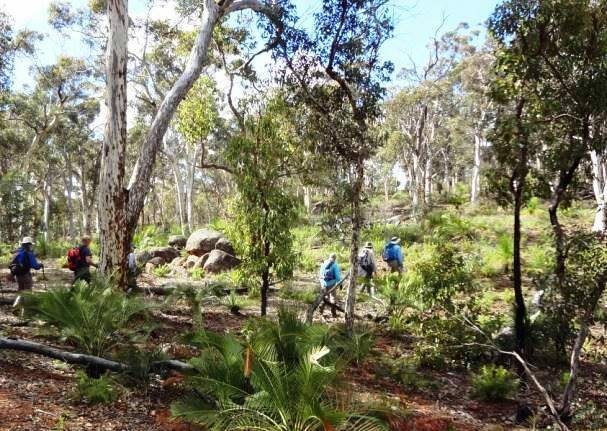 Walkers climbing slope through wandoo woodland. 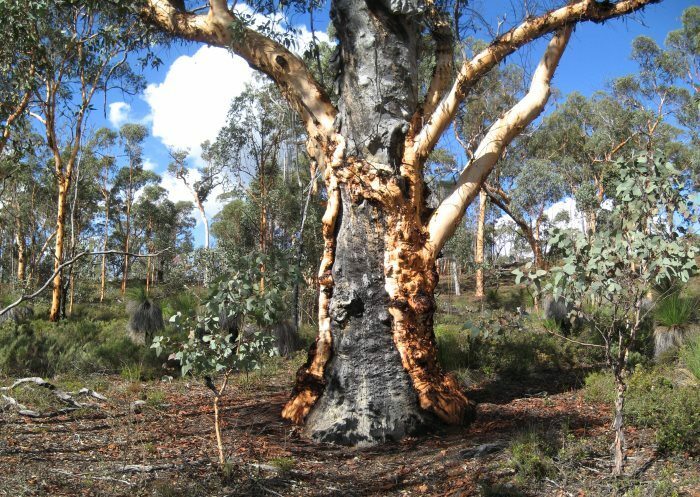 A resilient Powderbark Wandoo tree bears the scars of a past bushfire. 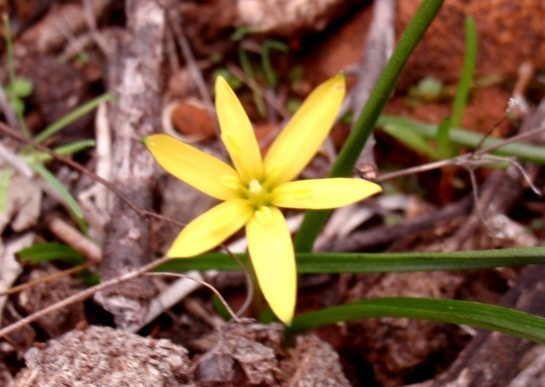 Yellow Autumn Lily (Tricoryne elatior). Walkers climb one of several small laterite-capped buttes. Wandoo trees on NW slope above Helena River valley. Curiously shaped. weathered granite rock above Helena River valley. Helena River spills over granite ledge at ford. Walker at second crossing of Helena River. 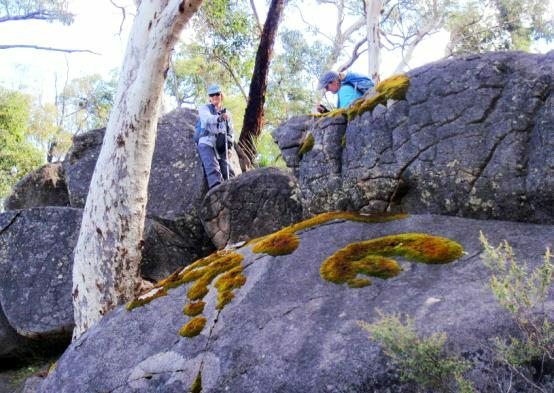 Walkers explore boulders north of Helena River.